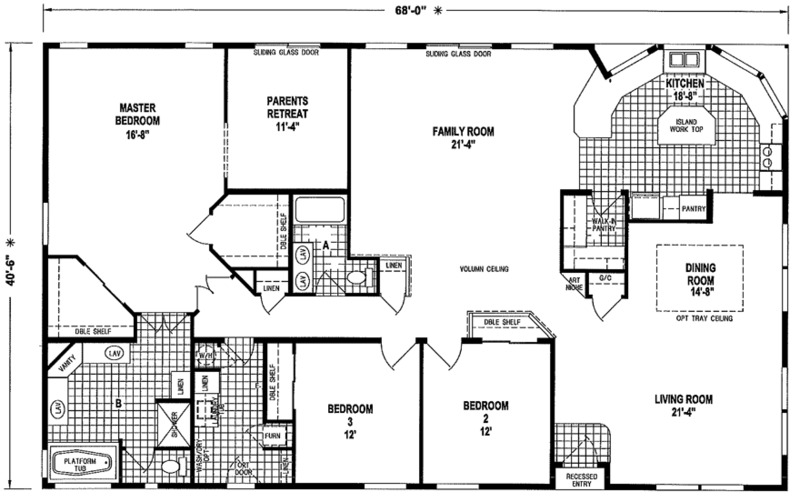 The Pearsoll model has 3 Beds and 2 Baths. This 2720 square foot Triple Wide home is available for delivery in Oregon, Washington, Northern California, Northern Idaho. Designed for the largest of households, the glorious Pearsoll is equipped with everything homeowners could ask for…Plus more! Highlights include a recessed entry, spacious living, dining and family rooms, island kitchen, parents retreat, sliding glass doors and multiple storage closets! Just wait until you see the luxurious master bath that features a vanity, multiple sinks, linen closet, shower AND Platform tub! Additional options and upgrades are also available. Ask your housing consultant about the other great features that come standard on the Pearsoll manufactured home.